This presentation by Gloria Flora, Cornell University, sums up what biochar is, how to use it, and the benefits it provides. Click here visit the USBI Initiative website. The Clean Water Act it is directed at agriculture and the control of runoff from manure pits and the necessity to clean and filter waste and cleaning waters. These required agricultural practices will be followed. Green State Biochar is currently working with dairy farms to ensure best management practices which utilize filtration systems for manure pits and cleaning waters. 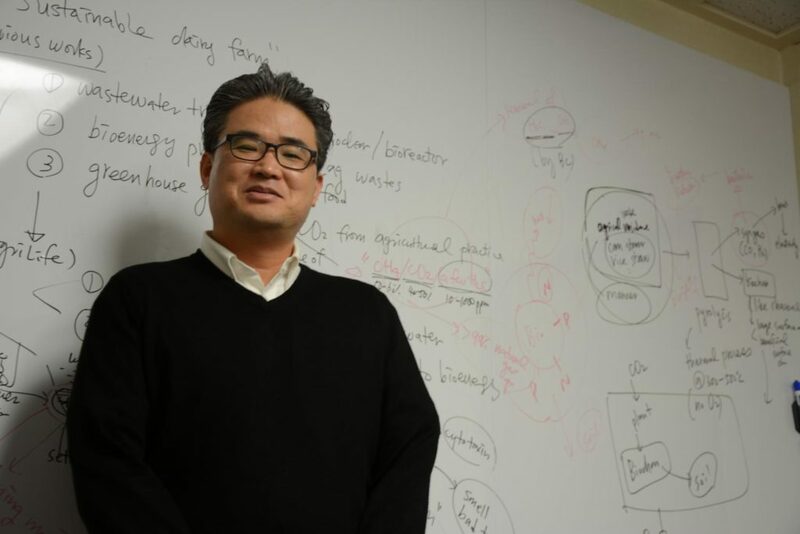 Dr. Eunsung Kan stands in front of a dry-erase board used to explain his closed-loop dairy farm concept and use of biochar to filter wastewater and create electricity. Credit: Texas A&M AgriLife Extension Service photo by Adam Russell. Dr. Eunsung Kan, Chemical and Environmental Engineer, Texas A&M explains how his system will prove to be a logistically and financially viable model for dairy producers which utilizes biochar to filter wastewater and to create electricity. And from the Rocky Mountain Institute – Positive Disruption – Agriculture, Forestry, and Other Land-Use Transformation – pages 27-30, addresses the need for transformation and the new forms of land management that are required to decrease emissions, increase natural carbon sequestration, and improve eco system health utilizing biochar!